This is the monthly archive for June 2006. As it says. I read only a few of them, and wrote one of them. The danger of the blogosphere revealed: we tend to forget there's an entire world out there, a world where Flickr is not the largest photo sharing site. Andy Budd's recommendation for drawing attention to books you like. Good idea; if you encounter my book somewhere, please turn it cover-out. Stuart visited Microsoft and reports. Once again, it seems Microsoft is firmly committed to openness. If you happen to own a mobile phone with browsing capabilities, do these tests. They might lead to a mobile phones compatibility table - and everbody knows we desperately need one. Isolani's notes on @media - continued. Simon repeats the points he made during the @media panel. 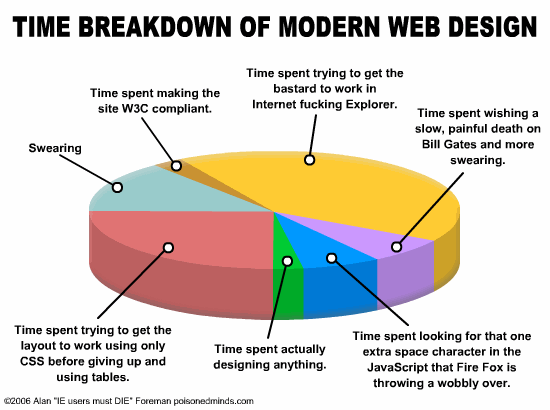 A pie chart of things we actually spend our time on. Post by Russ Weakley about tagging. I seem to have inadvertently committed a grave social faux pas when I dissed the touristy photos tagged 'atmedia'. In any case I have some reading to do. John Hicks on his panel. Presentation transcripts by the RNIB. Roger's wrap-up. He summed up the coffee problem better than I could. Molly is looking for an assistant. An excellent idea, since she's just too busy right now. Dean returns to the onload problem. Jeremy explains the basics once more; this time on ALA.
Isolani on the @media preliminaries. Andy Budd on his @media presentation. Jeremy's notes on his presentation and @media in general. Ian Lloyd's notes on the WCAG panel. List of Ajax patterns; similar to what I myself am looking for in my QuirksBlog entries, but a bit more low-level. A tip from the MSIE team: in IE 7, use the native XMLHttpRequest object, and not the ActiveX objects you need for IE 6 and lower. See the May 2006 archive.